Input text: america backdrop. 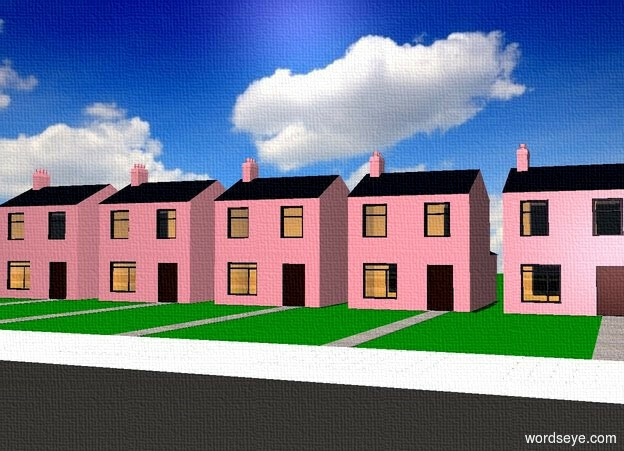 a 1st pink house is on a gigantic .1 foot tall green floor.. a 2nd pink house is 5 feet left of 1st house. a 3rd pink house is 5 feet left of 2nd house. a 4th pink house is 5 feet left of 3rd house. a 5th pink house is 5 feet left of 4th house. a 1st 50 foot deep concrete path is -1 foot in front of and -6 feet right of the 1st house. a 2nd 50 foot deep concrete path is -1 foot in front of and -6 feet right of the 2nd house. a 3rd 50 foot deep concrete path is -1 foot in front of and -6 feet right of the 3rd house. a 4th 50 foot deep concrete path is -1 foot in front of and -6 feet right of the 4th house. a 5th 50 foot deep concrete path is -1 foot in front of and -6 feet right of the 5th house. street is 500 feet deep and 100 feet wide. it faces right. it is -.5 foot in front of the 3rd path. a 1st lemon light is -5 feet in front of the 1st house. a 2nd lemon light is -5 feet in front of the 2nd house. a 3rd lemon light is -5 feet in front of the 3rd house. a 4th lemon light is -5 feet in front of the 4th house. a 5th lemon light is -5 feet in front of the 5th house.it is noon. sun is linen. camera light is pink.